We’d love your help. Let us know what’s wrong with this preview of Fred's Diary 1981 by Robert Fear. To ask other readers questions about Fred's Diary 1981, please sign up. I came to this diary with some expectation, having written a very similar diary myself…and only a few years after this one. And I was not disappointed. ‘Fred's 1981 Diary’ is a fascinating time capsule from the heyday of backpacking round Asia, when Dylan and Marley blasted from tinny tape machines, everybody headed north to the trekky north of Thailand or the funky houseboats of Kashmir, and dope was cheap and plentiful. Though in Fred’s case, the dope gets him into an awful lot of trouble, and I came to this diary with some expectation, having written a very similar diary myself…and only a few years after this one. And I was not disappointed. ‘Fred's 1981 Diary’ is a fascinating time capsule from the heyday of backpacking round Asia, when Dylan and Marley blasted from tinny tape machines, everybody headed north to the trekky north of Thailand or the funky houseboats of Kashmir, and dope was cheap and plentiful. Though in Fred’s case, the dope gets him into an awful lot of trouble, and after a slow-burn of a start in Hong Kong, where he finds work as a TV extra, we are suddenly plunged into a ‘Midnight Express’ scenario where he is flung into a hellhole of a Thai jail for possession. This section is riveting, and is the stuff of which films should be made. His ‘lucky’ escape – or rather deportation – leads him on to Nepal, where he somehow negotiates a gruelling week of trekking on a whole cornucopia of drugs (respect! ), then on to India, where he survives a number of near-death bus journeys, witnesses (and beautifully describes) a Kashmiri wedding ceremony, and battles with his feelings for girlfriend Rita, who has joined him from Germany. This latter part of the book I particularly enjoyed – far less straight reporting, far more reflection on the nature of relationships, and indeed of the nature of life itself. Okay, an awful lot of illicit substances have gone down by this point, but Fred – as honest and revealing as ever – tells it how it is: “I feel I’ve learned a lot, using hash and grass to set me thinking, not just to get blasted.” And it is this honesty, coupled with a very engaging and readable writing style, that ensures that this diary reads as fresh today as when it was first written. Highly recommended. In Hong Kong, he finds work as an extra in a TV production, then picks up his backpack and moves on to Thailand. Being stoned is a big part of Fred's travel adventures and being in possession of drugs gets him thrown into a Thai jail. Seemingly hell, I felt anxious while reading this chapter. But A Fascinating Journey! Long periods of travel of the sight-seeing variety inevitably involve much that is routine, unremarkable and, occasionally downright boring. Travel writers and diarists often make this explicit as does Bruce Chatwin in “In Patagonia” and William Fiennes even more eloquently in “The Snow Geese”. Robert Fear, in “Fred’s Diary 1981”, Travels in Asia also records the humdrum, the unexceptional and the ordinary – until, that is, he finds himself swept up by Thai police in a drug raid in Northern Thailand. It is then that this book changes gear and the commonplace becomes the extraordinary, the nightmare from which there is no relief in wakening up. The author becomes embroiled in the chain of corruption that may or may not lead to his release. After reading and enjoying “Fred’s Diary 1981”, I am glad that my own exploratory travelling was conducted in a much earlier and more prudent and period where temptations were few and far between and temperance and self-discipline was more the norm. A very enjoyable and very detailed diary. I was lucky enough to win a signed paperback copy of this book in a competition. I also have the kindle editions of both the new edition and the older edition, and, at various times, I did read parts of all of them to compare-eg: when I was at a hospital appointment, rather than taking my precious signed copy, I read on the original kindle version-I later got the brand new kindle version and continued reading from the two new editions. I like diary format A very enjoyable and very detailed diary. I thoroughly enjoyed reading Robert's accounts of his travels in Asia. It's a great insight into what was the standard 'pilgrimage' for young people in the 1970s and 1980s: to experience the exotic cultures and the breath-taking landscapes of south-east Asia, India and Nepal. Robert's diary is both a pithy travelogue and also a reality check in a way for what can also go wrong and the consequences of being in a different culture with different ways. I definitely recommend this memoir, with one p I thoroughly enjoyed reading Robert's accounts of his travels in Asia. It's a great insight into what was the standard 'pilgrimage' for young people in the 1970s and 1980s: to experience the exotic cultures and the breath-taking landscapes of south-east Asia, India and Nepal. Robert's diary is both a pithy travelogue and also a reality check in a way for what can also go wrong and the consequences of being in a different culture with different ways. I definitely recommend this memoir, with one proviso. This is a diary, straight out, not a memoir in the usual sense of a carefully crafted, re-imagining of the past. The text is bare-bones and contains repetitive observations, completely in keeping with it being a diary. This strict diary-style might be off-putting for some, and I struggled in the beginning until I came to terms with the fact that this is a diary, not a fleshed out memoir. After that I enjoyed it much more, simply reading on and taking in larger sections so that I got the 'flow' of it all. Robert has also bared himself here and for that I take my hat off. He doesn't attempt to reposition himself in a better (or worse) light, but to simply record what was happening and his immediate reactions at that time. It will take you a while to get into the cadence of the work. It is a daily diary, some days extremely monotonous, others documenting fascinating events. Just like life. Some entries are explicit in description of interesting places, others are a simple indication of having gone somewhere, visited a city, or taken Fred’s Diary is just that, a diary. This book is a compilation of the daily writings of Robert Fear describing his travels through Asia, his personal experiences, thoughts, and growth. The brave decision for me, was that he decided to transcribe it from the raw material without embellishment or any attention, or possibly regard, to the craft of writing This is a difficult review to write. Why? Because I do appreciate the author in publishing this diary made a very brave decision to do so “as-is.” It must always be borne in mind that all reviews are simply one person’s opinion. There were good things about this book and things that annoyed me but ultimately it is worth the read. One final thought - waking up 9 am or later on most days was such a waste. One can sleep in at home any time. Asia is a magical continent. It comes alive at four and five in the morning. The sights, smells, and noises of an early Asia day are more powerful than any drug. Robert Fear has written a masterpiece. Writing a story in the form of a daily diary is always a challenge but Robert Fear has shown how well he has mastered the art. On first look the presentation is simple – almost too simple. The reader is likely to be put off in the beginning with mundane details – the price of each and every item bought, the menu at every meal – but within a couple of pages the reader is mesmerized with the underlying beauty and gets hooked. The era is captured beautifully. Robert Fear has written a masterpiece. Writing a story in the form of a daily diary is always a challenge but Robert Fear has shown how well he has mastered the art. On first look the presentation is simple – almost too simple. The reader is likely to be put off in the beginning with mundane details – the price of each and every item bought, the menu at every meal – but within a couple of pages the reader is mesmerized with the underlying beauty and gets hooked. The era is captured beautifully. Getting initiated into the use of chopsticks, buying a glass of water for 5 paise, asking for coke and getting a drink called campa cola, the roadside scenes and imagery, the hotels, the eating places, all produce a strong sense of déjà vu in everyone who has been in that world. This was a trip on many levels: in terms of backpacking in 1981 with the differences between that age and this; a trip inside a man's mind who at times grapples with emotional survival with his on & off girlfriend but also grapples with survival when he lands in a Thai jail for possession of drugs; and a psychological trip because the author smokes SO much weed during this journey. It's an odyssey in dope and other nefarious substances and I did wonder if at any stage he'd end up quitting th This was a trip on many levels: in terms of backpacking in 1981 with the differences between that age and this; a trip inside a man's mind who at times grapples with emotional survival with his on & off girlfriend but also grapples with survival when he lands in a Thai jail for possession of drugs; and a psychological trip because the author smokes SO much weed during this journey. It's an odyssey in dope and other nefarious substances and I did wonder if at any stage he'd end up quitting the drugs. I enjoyed the read a lot but did hope for some further insights to go along with the detail of his days and some of the actual conversations he had that were the most interesting. I think he's a brave guy for managing incarceration, job disappointments, girlfriend sagas (although I would have loved to know what all the arguments were about?) and how he transitioned to life back in Europe. An interesting look back at the tail end of the hippy trail of the 1980s, when Fred abandons his job with a bank and goes off backpacking round Asia from Hong Kong through Thailand to India and Nepal. Recording his daily life meticulously, Fred's diary gives the reader an intimate account of his journey, which is about self-discovery as much as discovery of the countries he visits. The reader shares his meals (as a lover of Asian cuisine my mouth watered more than once), his lodgings, his fellow An interesting look back at the tail end of the hippy trail of the 1980s, when Fred abandons his job with a bank and goes off backpacking round Asia from Hong Kong through Thailand to India and Nepal. Recording his daily life meticulously, Fred's diary gives the reader an intimate account of his journey, which is about self-discovery as much as discovery of the countries he visits. The reader shares his meals (as a lover of Asian cuisine my mouth watered more than once), his lodgings, his fellow travellers and his casual use of dope, which lands him in jail. What I most appreciated in this book is his openness and honesty in revealing his inner thoughts and feelings about himself, about his hopes for the future, and his angst regarding his complicated relationship with his on/off girlfriend who joins him towards the end of his journey. Fred gives the reader an insight into many of the places he visited a few decades ago. I suspect a lot has changed since then, but many of the most important remain. I particularly liked his descriptions of the Taj Mahal in India. I was also amazed at how brave he was still smoking grass while waiting to be deported after being locked up for the same offence. His descriptions of prison were perhaps the scenes that I will remember the most. I would have liked more description of the surroundings and less of the drug taking and smoking and the daily diary routine was a little repetitive. A book reminiscent of the times when the youth went to the far east to think about life and sort out feelings. I won this book as a First Reads Book. Very good descriptions of travels. He enjoys the beauty of nature and other countries so much....it takes you right along with him. The many experiences, he leads you through are exciting and interesting. Not being able to travel to the many places that Fred's Diary talks about, I was able to enjoy the journey though Robert's writing. This book was very intriguing and I was always looking forward to the next journey he took you on! I did not find this very entertaining. It is a basic diary informing you of when he went to bed or woke up or got on a train. You can read of what he smoked, what he ate, who he talked to and how much he paid for things. Just not my cup of tea. Some people seemed to have enjoyed this book. This Diary is what the author lived and experienced so has value to him. Has no value to this reader except drug use is stupid and using in Asia is destructive. The tone of voice is like a diary and I kept hoping for something else, but didn't happen. I frequently found myself disinterested and skimming forward in this book. Yes, it’s a personal diary, so it can’t be expected to read like a novel — but Fred says he’s writing this diary specifically for others to read, so I think it’s fair to scrutinize the material. Mundane information seems to get the most attention in this book. Time of day and currency exchange rates are carefully noted. The reader hears about every minor physical complaint Fred has, his aches and pains and diarrhea, and h I frequently found myself disinterested and skimming forward in this book. Yes, it’s a personal diary, so it can’t be expected to read like a novel — but Fred says he’s writing this diary specifically for others to read, so I think it’s fair to scrutinize the material. Mundane information seems to get the most attention in this book. Time of day and currency exchange rates are carefully noted. The reader hears about every minor physical complaint Fred has, his aches and pains and diarrhea, and how he’s budgeting his money, and the precise list of foods he ate that day. But Fred very rarely describes the places he spends his time in, or any actual interesting aspects of his journey. He’ll tell you that he went shopping and bought shampoo. What kind of store did he visit and what did he see along the way? Who knows? He’ll tell you that he bought some lichees and ate them, and that lichees are a type of fruit. That’s it. If you don’t know what a lichee looks or tastes like, or how to peel one, well, this account certainly isn’t going to tell you. The same few shorthand descriptions are used a lot. Nearly everything Fred eats is described as “tasty”, whether it’s a local specialty or just peanut butter on toast. And every conversation is “a nice chat”, with no hint of what was chatted about. Fellow travellers are just names and nationalities, rarely given any distinguishing characteristics. I found it all disappointingly vague for a diary that’s meant to share experience and understanding. Fred does have occasional reflective moments where he describes some striking scenery, or shares a philosophical thought in enough detail that I actually felt included, but these moments were vanishingly rare. The blurb also promises an understanding of drug culture. But there’s no real discussion of cultural attitudes, not even when Fred is surprised to find himself in prison for drug possession. After that brief stint in prison, Fred learns nothing and casually does a wide variety of drugs with almost everyone he meets, with no consequences or difficulties. Just about every fellow traveller pulled out some weed/hash/opium to share with Fred, to my strained belief. Most days’ entries are dominated by doing drugs, feeling good, lazing around the … wherever it was Fred was staying at any given time, and having those “nice chats” with nondescript people. After reading this book I feel sorry that he missed out on a opportunity to write a well written informational book. Every chapter started out the same. He really didn't delve into anything, which was a pity. I wish he put more thought into this book it could have been a winner. I found the day to day interactions interesting. The cheap accommodations, room sharing with strangers, and drug use surprised me. Overall I liked the book. Don't waste your time unless you are interested in how much dope he gets during his travels. It was definitely not a book I would recommend. I enjoyed reading this book. It was an interesting recounting of Fred's travels in Asia and India. Some thing that I wanted to do back in the 70s but alas never did. Born in Leicester in 1955, Robert's family moved to Surrey when he was 11. He was educated at Reigate Grammar School. After this he worked in a bank in the city for several years before getting the travel bug. Fred, a nickname he got at school, stuck throughout his travels and has remained with him to this day. His travels took him to Ibitha for the summer of 1977, hitch-hiking around Europe in 19 Born in Leicester in 1955, Robert's family moved to Surrey when he was 11. He was educated at Reigate Grammar School. After this he worked in a bank in the city for several years before getting the travel bug. Fred, a nickname he got at school, stuck throughout his travels and has remained with him to this day. His travels took him to Ibitha for the summer of 1977, hitch-hiking around Europe in 1978 and the USA and Canada in 1979. During this time he also settled and worked in Germany. 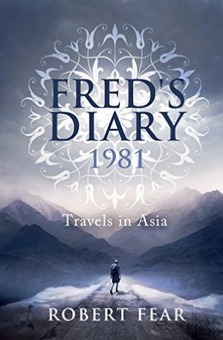 Fred's Diary 1981 was written during the 158 days he spent travelling around Asia.